I am interested in improving outcomes for people with chronic respiratory disease through individualised targeted management. I also focus on understanding the complex nature of difficult to management airway diseases, and am examining the impact of novel interventions for people with lung disease focusing on the airways, comorbidities (other diseases at the same time), behaviours and self management strategies. I began my career as a clinical nurse where I was fortunate enough to have mentors and leaders who taught me the importance of, and supported me in, the delivery and transfer of evidenced based practice. Whilst working in a dynamic and innovative multidisciplinary team I could experience first hand the impact that research has on patient care and outcomes. This ignited my appetite for research. Finding treatments that improve outcomes for patients that can be translated into the clinic excites me! Within my working life I would like to see a paradigm shift in our approach to managing not only airway diseases, but chronic disease in general, with the implementation of precision medicine. I want my research to inform a health care system where patients are managed in partnership, with individualised and targeted approaches to improve outcomes for patients. My future focus is looking 'beyond the lungs' from a number of perspectives. Firstly in terms of characterising the comorbidities and risk factors that impact patients with chronic respiratory diseases in order to develop and test novel interventions that can be translated into clinical practice. Secondly, to adapt and apply these approaches to patients with non pulmonary related chronic disease. 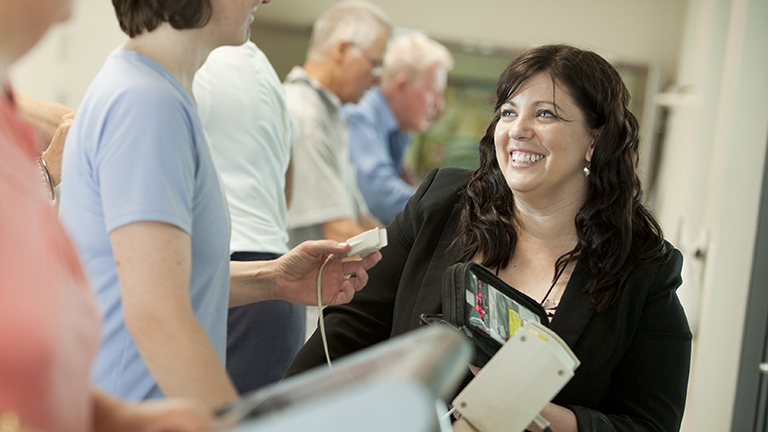 Vanessa McDonald is a research leader in HMRI's VIVA Program, co-leader of the NHMRC Centre for Research Excellence in Severe Asthma and a practicing academic clinician in the Department of Respiratory and Sleep Medicine at John Hunter Hospital. Vanessa’s research interests are centred around the development of innovative approaches to the management of chronic airway diseases particularly severe asthma and COPD. Her translational research programme links biomedicine, clinical effectiveness and health policy development. The programme focuses on clinical trials of treatment interventions that are individualised and targeted to biomarkers, clinical, functional and self-management needs. Vanessa has published widely in high impact journals, book chapters and clinical practice guidelines for asthma, severe asthma and chronic obstructive pulmonary disease COPD). She has also had a lead role in the development of national health professional and patient related resources to improve the knowledge and skills for the management of lung disease. She has received a suite of peer reviewed competitive research awards attesting to the quality of her work, including the HMRI's Early Career Researcher of the Year in 2013 and The University of Newcastle's Vice Chancellor's Award for Researcher of the Year in 2014. Vanessa was a consultant and working party member for the review of the 2014 Asthma Management Handbook. She is also a member of the writing committees for the National COPD-X guidelines, the Australian Pulmonary Rehabilitation Guidelines and the Respiratory Therapeutic Guidelines. Congratulations Vanessa McDonald for being named Researcher of the Month!